On Sunday, November 4, 306 brave folks including 11 Finish Strong athletes and family members took on the Oilman half Ironman race in Montgomery conquering the frigid, rainy 1.2 mile swim in Lake Conroe; the difficult hilly 56 mile course through the park; and the final half marathon on La Torreta’s golf course and nearby property. Finish Strong and SelecTRI volunteers did a fabulous job with body marking, working transition, wet suit stripping, and handing out medals at the finish line. Congrats to our athletes and kudos to all who volunteered! Congrats to Finish Strong’s Jack Alexander and Hollie Wells for their performance at Saturday’s Fairfield Sprint Tri. Jack won male master’s in 57:49. Hollie won the women’s 45-49 Age Group in 1:32:37. Well done! Katherine Barron – 5:35:21 – her first half Ironman! Chris Bergfield – 5:39:16 – his first half Ironman! Phillip DePrang – 5:53:43 – 2nd in AG! Dana Lyons – 4:16:08 – 1st in AG! Angela Strong – 5:52:48 – her first half Ironman! Christina Tomlinson – 6:55:05 – her first half Ironman! 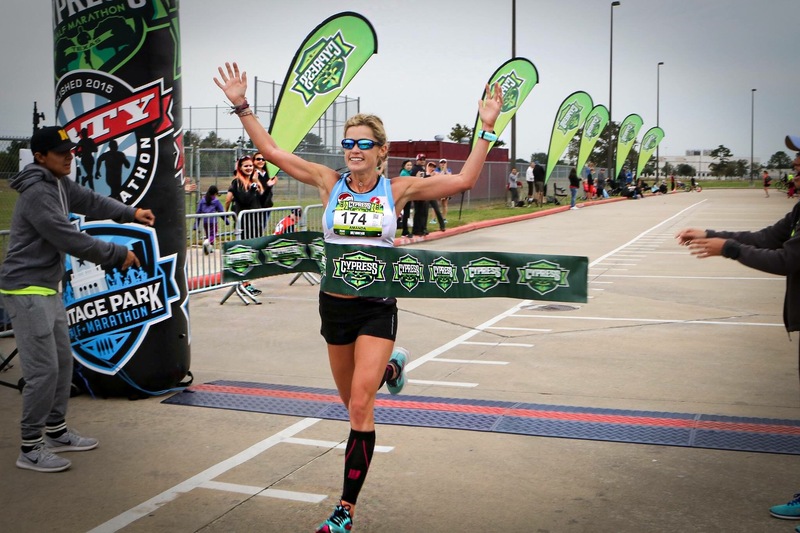 Congrats to Finish Strong Racing Team for their excellent showing at the 10 for Texas 10 mile and 5K held on Saturday, October 13, 2018 by The Woodlands Township. This year had a new course starting and finishing at North Shore Park with portions of the race on the water way. Finish Strong was represented well by 36 athletes. The team won Male Grand Master and Master’s at the 5K race by Rudy Justice and Kevin Baker. Kevin was also 2nd overall. The team also captured three 1st place Age Group wins in the 5K by Jhovanny Landeros, Julio Morales, and Deb Lyons and a 2nd AG by Katerina Savelieva. 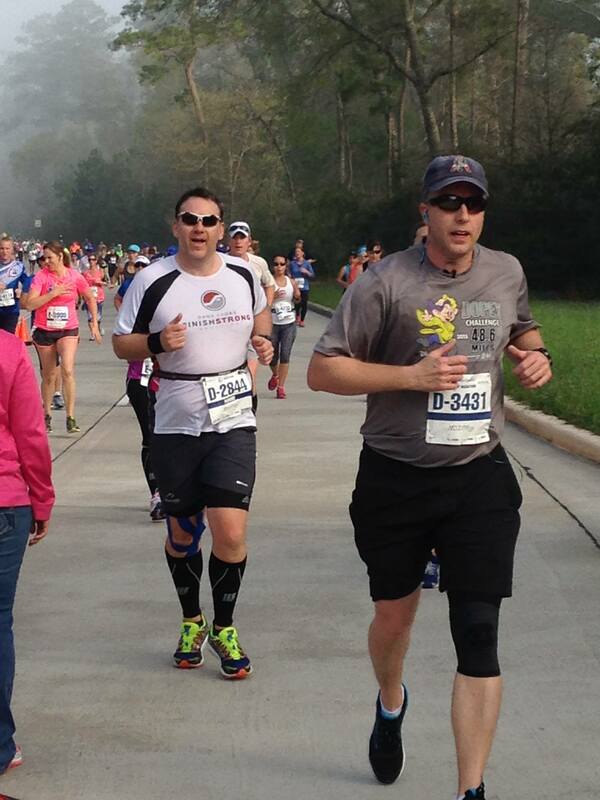 The main event – the 10 miler — was also a great event for the team. Michael Menster came in 5th overall and male master’s. Bill Glaser and Sharon Morin won their AGs. Dana Lyons and Guillermo Locht took 2nd in their AGs. And PRs were attained by Joe McClellan, Monica Lanman, and Lynn Bennick. Special thanks to Christi O’Neal for treating us to wonderful stretches post-workout at our tent! Congrats to all. See results below. Congrats to all 39 of our Finish Strong athletes who competed in The Woodlands Marathon/Half Marathon/5K on a beautiful March 3rd morning in The Woodlands. 31 of our athletes ran the half marathon; 3 completed the marathon; 3 ran 18 miles of the marathon as a training run; and 1 ran the 5K. We had several PRs, Boston Qualifier, and three folks on the podium. Way to go! For more pics, go to our Finish Strong Coaching Facebook page and like us! Michelle Howard TW Full 4:06:52 BQ! Barry Carroll TW Half 1:46 PR! Joseph Tokarz TW Half 1:50:17 PR! Rob Banzaf TW Half 1:35 PR! Victor Martinez TW Half 1:39:46 PR! Yves Puisseux TW Half 1:40 PR! Congrats to twenty-nine Finish Strong athletes who competed in the blustery cold Chevron Houston Marathon and Aramco Half Marathon on Sunday, January 14, 2018. 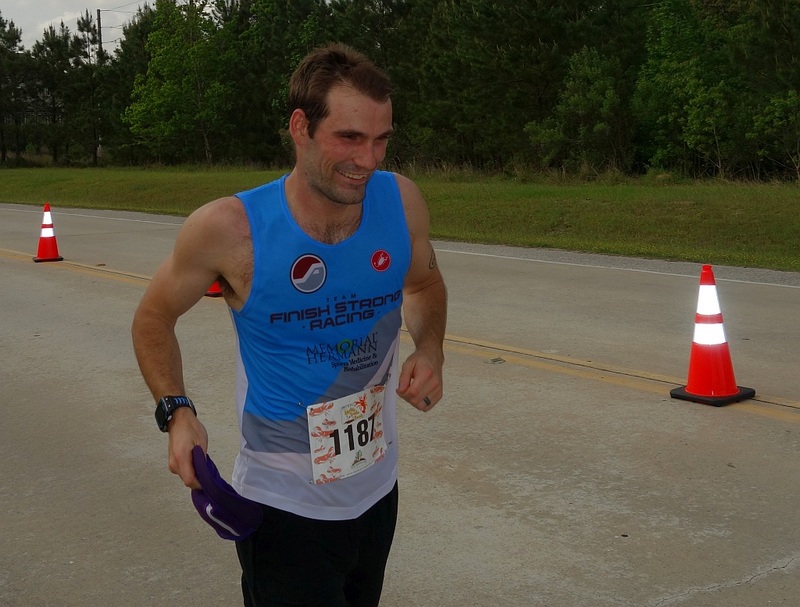 Steve Rech – 4:02:37 – 1 HOUR PR! Congrats to all for toughing out the cold conditions! Way to go!! Finish Strong Racing athletes braved the cold temperatures and participated in the Towne Lake Olympic and Sprint Triathlon and Duathlon on Sunday, December 10. Dale Claudel won 2nd overall in the duathlon. Mark Hanlon was Master’s Winner in the Olympic triathlon. Mark was 7th overall out of a reduced field of 91 because of the 55 degree water temp and 35 degree air temp. Mark Hanlon wins Master’s in the Olympic Tri! John McGowan overcomes the cold! Happy Thanksgiving! And congrats to all who participated in a turkey trot today. The Woodlands hosted the Run through the Woods – 5 mile and 3 mile run and 1 mile kids run. Mike Menster, Bill Glaser, Kevin Baker, Pam Meaux, and Sharon Morin all represented Finish Strong Racing and had podium finishes. Way to go! It was a beautiful morning for a half marathon for Finish Strong’s Ileana Carroll, Bob Bailey and Sara Vanderford who finished together at the Cypress Half Marathon. Congrats to Finish Strong’s James Carlson who raced Ironman 70.3 Austin on October 29 in 5:36:58 overall capturing his best half Ironman performance to date. Way to go, James! See below for James’ splits.